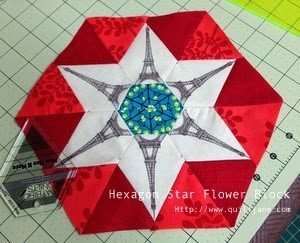 The hexagon star flower block has always been one of my favourites. 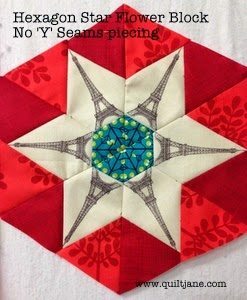 Traditionally pieced with ‘Y’ seams it can be challenging block to make. 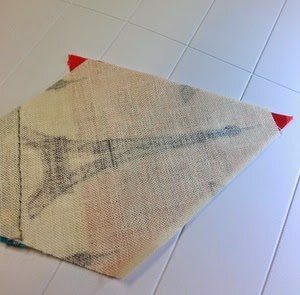 Recently, I had the opportunity to demo the Jaybird Quilts rulers. 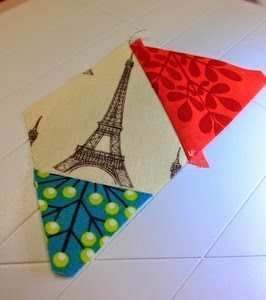 Jaybird has a wonderful collection of patterns that accompany the rulers but I wondered if I could cut and piece some of my favourite blocks that used shapes that had 60 degree angles or part therefore of – equilateral triangles, hexagons, half hexagons and jewels. 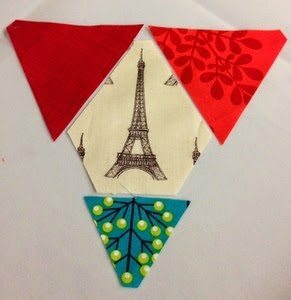 Each segment is made from setting triangles, a jewel and centre triangle. There are 6 segments. I used the following markings on the mini ruler. 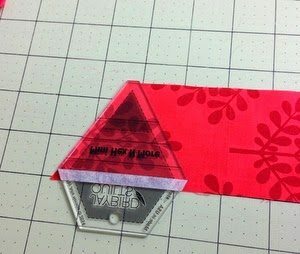 6 equilateral triangles from each 2 1/2″ strips. There is no marking on the ruler to cut at the 2 1/2″ mark so I placed 1/4″ tape under the dashed line. I left the overhanging ‘rabbit ears’ when cutting. Flip the ruler to make the next cut. 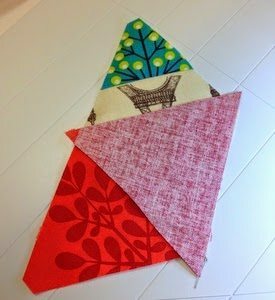 You should have a total of 12 equilateral triangles – 6 of each fabric. 6 jewels. I fussy cut these pieces. 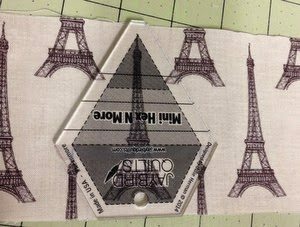 I placed the ruler over the desired pattern repeat and cut a 3 1/2″ strip, centring the feature pattern ( Tour Eiffel ). 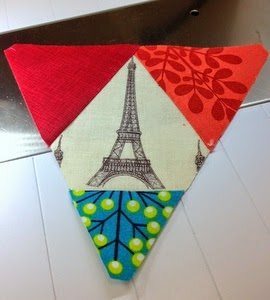 Sew a centre triangle to the base of a jewel. There should be 1/4″ overhang at each end. Press open seam. Make 6. Add a setting triangle to one side of each jewel. There will be a 1/4″ overhang on each side of the piece. Press seam open and remove ‘rabbit ears’. Make 6. Repeat for other side. Make 6. Arrange finished units into 3 segments to make a 1/2 hexagon. 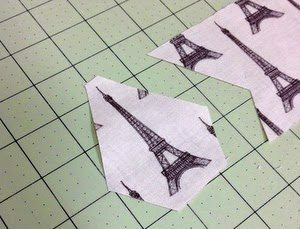 Sew together, matching seams at intersecting points. Sew the 2 halves together. 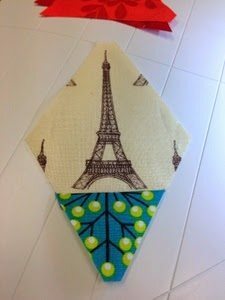 I might continue using different fabrics and make a quilt. To make the assembly of a quilt top easier, I would leave the block unfinished in 2 halves, so I could join the rows without using ‘Y’ seams. I would love to see blocks made with this method and ruler. Use #miniHexnMore on social media. I love it Jane! I have the large hex and more ruler coming in the mail but I can see the mini won't be far behind! Love this version Jane! 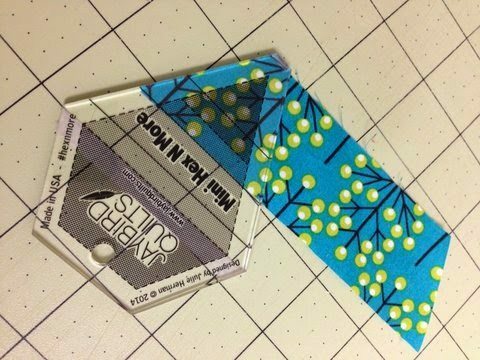 And @jaybirdquilts rulers are terrific to work with, easy to use and perfect piecing. This is wonderful. 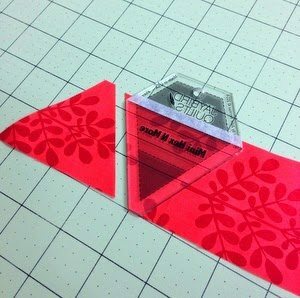 I really dislike Y seams so this tutorial is perfect! 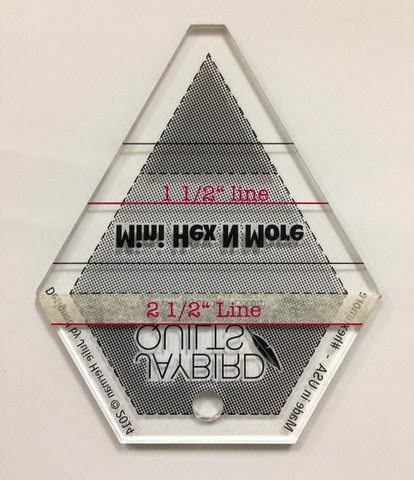 Wonderful block – maybe I'll finally get around to taking the shrikwrap off my hex and more ruler, ugh, it's been taunting me but I have more ideas than time to sew lately. A scrappy version with the design would be awesome. It looks paper pieced and isn't (happy face). 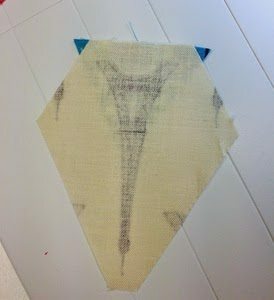 I don't have the mini, I have the larger hex n more – I can see that I will be playing around with some fun fabrics and sizing to get the same effect with the larger ruler. What size Hexie does this make? I tried to estimate, but… Wonderful block! Thanks! I may have missed it, but how big do these end up at? I have the big version on the hex and more ruler and am doing her "Toes in the Sand" pattern. It is fun and the blocks are so easy. I need to get the mini ruler for smaller blocks. It is a great ruler, really genius. this looks like a template that would be really useful, unlike so many I have bought in the past and never used. I love this! I need this ruller so that I can make one!!!!!! Fantastic! What a great way to use this ruler, and what a terrific tutorial on how to create this beautiful block. Thank you! Holy smokes! I have this ruler, and was wondering what I could do with it, and here you go giving such clear, easy directions. Thank you so much! This simplifies things tremendously. how do you sew the 2 halves together and have it still lay flat in the middle where all your seams meet? Mine keeps bunching up! wonderful. I had just watched the mini hex video but it was only about cutting. Your tutorial is great. Love the fussy cut design also.